Do you have an old discarded computer lying around which you are wondering how you could put to good use? I do. And I am sure most of you who bought your first computer around 7 years back would too. Well, now you can put it to use as a network firewall - even if your network contains only one other machine ;). 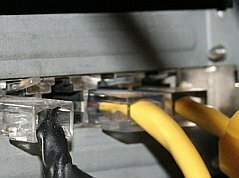 Will O'Brien has written a very good article giving step-by-step instructions to setup a network firewall using a discarded computer sans a hard disk. In fact, the firewall is run using a Linux live CD (Devil-Linux) and it stores the configuration on a separate disk like a floppy disk or USB key which is what makes it really interesting. Also he has used a 3 port ethernet NIC (Didn't know there was one) for the experiment as it uses up only a single PCI slot and the kernel module is shared between the three ports. A really useful project described in a simple and lucid manner.